Modern bistro chairs in this section mainly consists of plywood shell chairs seven layers thick. 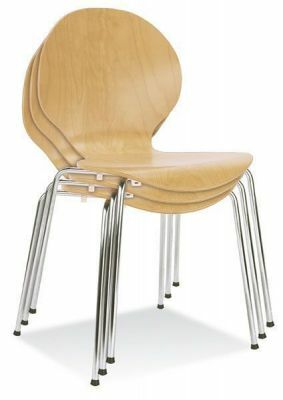 This gives these café chairs extra strength and rigidity making them suitable for high traffic commercial areas. We supply chairs to restaurants, canteen areas, bars, office break out spaces and many other applications throughout Europe and sometimes beyond. The Piazza 6 butterfly style café chair is one of our most popular chairs and is available polished to nine different wood finishes or five optional lacquered paint colours. The beech and chrome version of this chair is held in stock, other finishes and the silver or polished aluminium frame option are on a 4-5 week lead time from the factory. This bistro chair is also available with an optional seat pad or seat and back pad which we are advertising in a broad selection of woven and stretch fabrics as well as some colourful faux leather options. The Piazza classic triangular back café chair made famous by Christine Keeler in the sixties and inspired by the 3107 chair designed by the renowned Arne Jacobsen is a firm favourite is available in nine wood finishes or ant RAL colour subject to a small set up charge. Our Piazza classic is made to a high quality in Europe under the ISO quality assurance banner. This chair is currently on view at the Victoria and Albert Museum in London. Another favourite Café or Bistro chair, the Bingo is proffered due to its distinctive frame which confers a greater sense of strength and stability. This chair is also available in fully and part upholstered options and three options of frame finish. All these chairs are delivered assembled and boxed ready for use and are stackable and lightweight for convenient use. These are just three of our comprehensive selection which we continually update as more and more designs become available.